Russia has agreed to provide Hungary with billions of dollars upfront to finance the planned extension of the Paks nuclear power plant south of Budapest – yet the deal is raising hackles over a lack of a proper bidding process and the absence of public consultation. Russian President Vladimir Putin (2nd right) looks on as Hungary's Prime Minister Viktor Orban (left) shakes hands with Rosatom head Sergei Kiriyenko (right) during a meeting at the Novo-Ogaryovo residence outside Moscow on January 14. 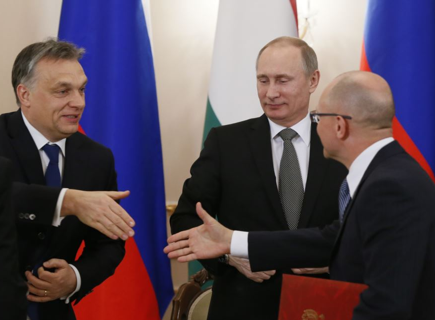 Russia has agreed to provide Hungary with billions of dollars upfront to finance the planned extension of the Paks nuclear power plant south of Budapest – yet the deal is raising hackles over the lack of a proper bidding process and the absence of public consultation. Russian state nuclear corporation Rosatom agreed yesterday to expand the Paks plant for some $13.6 billion, doubling its size in the largest construction project in Hungary’s post communist history, and something Rosatom is portraying as a major move onto the EU nuclear market. Russian President Vladimir Putin said that he and visiting Hungarian Prime Minister Viktor Orban had signed an agreement on the project at Paks, which already runs four Russian-made VVER-type reactors built in the 1980s. The new project will see two new reactor blocks built of the VVER-1200 type, which will boost the plant’s capacity to 4000 MW. Putin and Orban added the Paks station was already responsible for producing 40 percent of the energy consumed in the EU member country. Vladimir Slivyak, co-chair of Russia’s Ecodefense, wrote in a blog on the independent radio station Echo of Moscow that bumping the output of the Paks plant to supply 80 percent of the country’s electricity seemed absurdly high. Hungarian government ministers told news agencies that 80 percent of the financing would be covered by a 30 year loan from Russia, and the remainder would be financed by Hungary. Environmental activists in Hungary are outraged over the decision between Putin and Orbin because it fails to take into account local public opinion about the giant nuclear build out. As recently as last year, Hungarian environmentalists also expressed outcry over their government’s plan to repatriate to Russia a batch of spent nuclear fuel that was severely damaged during chemical treatment in 2003, saying the fuel transfer would openly neglect public health and environmental concerns. By Russian law, Moscow is obligated to take back spent nuclear fuel from fuel that it has supplied to other countries. But Bellona’s Andrei Ozharovsky, a nuclear physicist and frequent contributor to Bellona.ru, has argued that the degree of damage suffered by the fuel rods in question warrants their reclassification as waste, which would imply a whole new set of legislative safeguards in accepting it. The damaged fuel assemblies, some of which are broken, are currently being stored at the Paks’ plant’s cooling pool at it’s No 2 reactor. The No 2 unit, from which the fouled fuel rods were removed in 2003, had to undergo 18 months of repairs before coming back online. But much of Rosatom’s financial strategy is banking on building nuclear power plants abroad, as well selling and repatriating fuel from foreign nuclear power plants. As a sign of how poorly things are going on its domestic market, Rosatom announced in November that it would be slashing its ambitious “2008 Roadmap” plans to construct 35 nuclear reactors in Russia by 2020 in half, cutting the number to a more humble 12. But, since the March 11, 2011 disaster at the Fukushima Daiichi nuclear power plant in Japan, Rosatom has shored up more than 20 nuclear reactor building contracts and has a foreign order portforlio totaling more than $74 billion, RIA Novosti reported. Among other countries that have contracts with Rosatom are India, Iran, China, Belarus, Bangladesh, Jordan, Bulgaria, Vietnam, Ukraine, Armenia, Turkey and Finland. Clearly, Rosatom is placing its bets abroad. The Moscow Times reported that Russia has another 40 nuclear construction contracts under consideration. Rosatom head Sergei Kiriyenko told RIA Novosti that the revenues from the contracts to repatriate fuel from Paks alone will generate twice the revenue of actually building the two new reactors, Kiriyenko told RIA Novosti. The home grown construction of the two new reactors will also be a significant money spinner, Kiriyenko told the agency. Indeed, according to Alexander Nikitin, chairman of the St. Petersburg-based ERC Bellona, Rosatom’s eagerness to repatriate the fuel that it sells abroad to plants built by the state company’s international arm, Atomstroiexport, is a major selling point to international customers of Russian nuclear power plants. “International construction (of nuclear power plants) on the Build-Own-Operate or Build-Own-Operate-Transfer contract is a pregnant issues because it means that Russia itself returns spent nuclear fuel and the problems associated with it to its own territory, which ecologists oppose, considering the scheme as “ecological underbidding,” wrote Nikitin in a commentary entitled “Rosatom in 2013 – Overview of the past year from the position of the ecological community,” on Bellona’s Russian pages. Such fuel return contracts, however, Nikitin noted, are a source of environmental and fiscal concern at home. Firstly, the money forwarded by Russia for the Build-Own-Operate contracts comes straight from Russian federal coffers at the taxpayer’s expense. And costs are constantly in flux in accord with market demand – a recipe for loosing millions. Secondly, Russia is decades away from dealing with its own 22,500 ton pile of accrued domestic spent nuclear fuel, which is stored primarily on site at the country’s nuclear power stations. Rosatom is only now beginning to site possible long-term repositories, the only recognized way of safely storing nuclear waste and spent nuclear fuel for more than several decades. Nuclear market experts told Deutche Welle that Putin and Orban’s bilateral agreement might draw criticism both at home and from EU officials because it arose without formal bidding procedures, with France’s Areva and US electric company Westinghouse among the companies having expressed interest in a contract with Budapest. The Hungarian newspaper Nepszabadsag, however, reported that Rosatom was the only potential bidder to offer pre-financing of the mind-numbingly expensive project. Nonetheless, the lack of international tenders has provoked Hungarian environmentalists to cry foul over what they say amounted to a less than transparent bidding process, The Moscow Times reported.